This was my first time for a bookstore signing for Whale in the Door. Here’s how it works. You sit in a bookstore surrounded by your books, waiting for people to take notice, ask about your book and maybe buy one so you can sign it. The whole afternoon was made enjoyable by the welcoming presence of Dan Ellis, the owner of Armchair Books, who had set up a nice little nest for me with a comfy chair and posters letting people know who I was and that I would be giving a reading at the Whistler Public Library that night. That’s Dan in the photo. 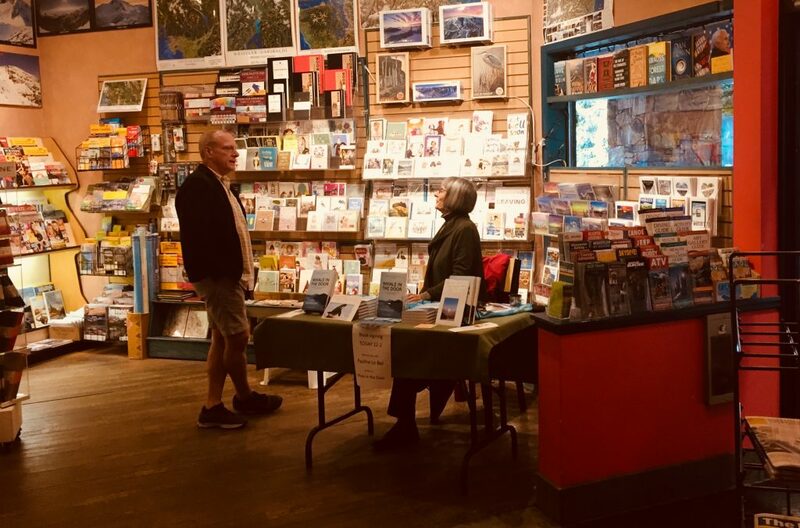 It’s a warm and cozy bookstore with some of the funniest greeting cards I have ever seen, all kinds of magazines, beautiful journals – I bought one – and of course books. The store was bustling. I was prepared with homemade signs inviting passersby to ask me about Orcas or Glass Sponge Reefs or the original name for the mountain peaks known as The Lions – it’s Chichiyuy – it means The Sisters and there is a wonderful Squamish Nation legend that goes with it. I got to tell that inspiring story to the delightful young Maya and her mother, Allison, who will read Maya the more refined version as told by storyteller Rebecca Duncan in my book. I also got to direct people to the nearest bathroom and the nearest bowl of soup. And there were engaging conversations with people from Washington State, Vancouver Island, Tasmania and Chicago – the latter were irate about the rain – I guess it doesn’t rain in Chicago. One young man, named Mack, was looking for the Ziplines. I was no help there. He ended up buying the book and congratulating me on spreading the word and asked for a selfie with me. Thanks Mack. Hope you found the Ziplines. Thanks Dan for an enjoyable afternoon. I just might do it again.